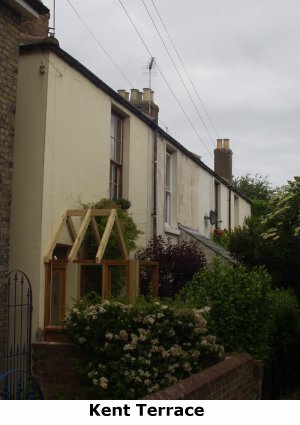 ‘old brick and slate cottages containing 3 small bedrooms, living room, kitchen and scullery, good garden in rear with frontage to Middle Deal Road. The gross value of the property was deemed to be £175. The owner of the freehold was a Miss Mary Denne of Shooters Hill Road, Blackheath, who was responsible for rates, insurance and repairs. No 1 was occupied in 1881 by the 7 members of the family of John Taylor, an agricultural labourer. Then it was occupied consistently by members of the Scarlett family by 1898 to at least 1968. In 1911 Frederick Scarlett was a bricklayer. His 2 sons, gardeners, lived at home with a sister at school. Mrs Scarlett had had 9 children, of whom 4 had died. No 2 was occupied in 1881 by the 9 members of the family of John Bishop, a miller’s labourer. It was occupied by 1910 by John Bailey, a jobbing gardener, and his daughter Agnes Annie, who was a housekeeper. She continued to live there until at least 1940. No 3 was occupied in 1881 by George Farrier, a miller, and his wife.By 1898 Joseph Denham and his family lived there. In 1910 he was a carpenter, living with his wife, two of his 5 adult children, and 2 ‘boarders’. It was later occupied by members of the Edney and Rook families. No 4 was occupied in 1881 by Culmer Allen, a gardener,his wife and an 18 year old niece, a teacher. By 1911 the Farrier family lived there, consisting of John and Margaret and 7 of their 8 children. John was a police constable. The cottage was subsequently occupied from around 1921 to at least 1940 by W. Uden, another police constable with the Kent County Constabulary. No 5 was occupied in 1881 by William Dunn, an agricultural labourer, his wife and 2 daughters, Eliza and Emily, who were dressmakers. Emily continued to live there and was joined by Charlotte Dunn, her niece, also a dressmaker. Charlotte remained in residence until at least 1957. The Census records indicate that all the residents were born in the local area of Deal and nearby villages, or other places not very far from Deal. The farthest was Canterbury. It appears that people did not move around very much . The earlier records indicate that agriculture and milling offered significant employment opportunities.